In the face of the increasingly variegated ideological landscape of contemporary America, cults have become the focus of public controversy. The growth of new religions has been matched by the development of an organized and vocal opposition, the anti-cult movement. This in turn has prompted an extensive investigation of new religious movements (NRMs) by sociologists and psychologists of religion, as well as historians and religious studies scholars. 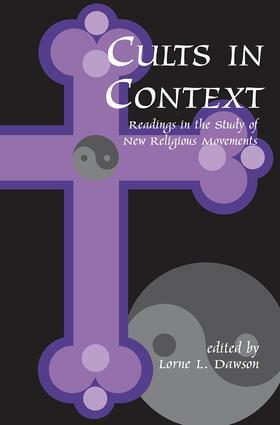 The readings collected here contribute to the debate about cults by sampling some of the best and most accessible publications from the academic study of NRMs.The contributors address the questions most commonly asked about cults, such as: What brought about the emergence of new religious movements? What is a cult or new religious movement? Who joins new religious movements and why? Are converts to new religious movements brainwashed? Why did the Jonestown and Waco tragedies happen? Are cults inclined to be violent? What does the emergence of so many new religious movements say about our society? What does it say about the future of religion?Cults in Context surveys the descriptive typologies, theories, and data accumulated by sociologists and psychologists studying new religious movements over the last twenty years. It serves to defuse many popular fears and misconceptions about cults, allowing the reader to develop a more reasonable and tolerant understanding of the people who join new religious movements and the functions of these movements in contemporary society.